Comparative effects of traditional processing methods such as germination, roasting and germination followed by roasting on nutritional composition and reduction of antinutritional factors in red peanuts (Arachis hypogea) and small red kidney beans (Phaseolus vulgaris) were studied. The seeds were germinated at 28-30°C in the dark for 96 h for peanuts, 72 h for beans and roasted at 140°C for 20 min. Raw and processed peanuts showed the highest levels of energy, fat and proteins, while beans showed the highest levels of antinutritional factors such as phytates, condensed tannins, trypsm. and a-amylase inhibitors. Dehullm. g caused a significant in. crease (p<0.05) in energy and protein and totally eliminated condensed tannins in both legumes. The combination of germination and roasting was the best method in reducing antinutritional factors in both legumes when compared to germination and roasting. Legume seeds such as small red peanuts and red kidney beans are good sources of proteins, complex carbohydrates and some minerals. Additionally, peanuts are a good source of energy due to their high content of fat, close to 50%[h]. However, peanuts and red kidney beans contain some antinutritional factors such as phytates, condensed tannins, trypsin and a-amylase inhibitors, that may limit it their usage and nutritional value. Traditional processing methods such as germination and roasting could effectively improve the nutritional value of legume seeds. Alonso et al reported an increase in protein content and a decrease in. phytic acid level, condensed tannins, trypsin and a-amylase inhibitors, after 72 h germination of kidney beans in an aired and dark incubator at 25°C. A decrease in trypsin inhibitors in traditional germinated beans and in germinated and boiled black beans has been reported in previous studies, but traditional processing methods did not affect iron, zinc and calcium contents. 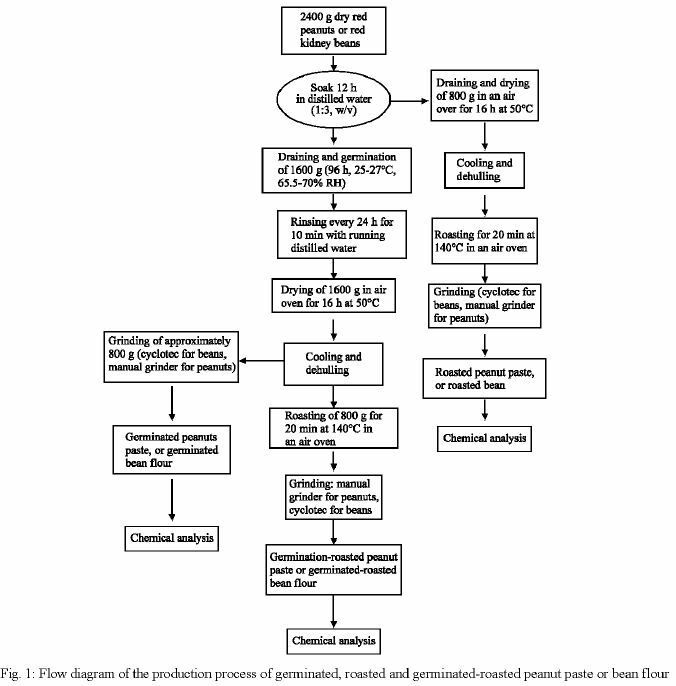 In peanuts, some authors have reported changes on the chemical composition and lipid content as a result of roasting and germination, but information on the effect of traditional processing on peanuts remain’ s scarce. The aim of this study was first to in. vestigate the efficiency of processing methods on nutritional composition, mineral and vitamin changes and on the reduction or elimination of antinutritional factors in peanuts and beans and secondly to investigate processing methods for an optimal nutritional quality of end products. An emphasis has been placed on identifying the most effective methods to reduce antinutritional factors in. peanuts and beans at a domestic level. Protein levels were significantly greater in processed peanuts and beans, compared to the raw seeds, due to both dehulling and germination. Although the increase in protein was more important in dehulled and processed beans than in dehulled and processed peanuts, the values remained higher in peanuts compared to beans. Alonso et a1.131 observed significant increases in protein levels in kidney beans after dehulling (6%) and after 7211 germination (3%). Ivlubarakm also reported a 9.1% increase in protein content in mungbean seeds compared to raw seeds, but Njitang et aLm reported an average decrease in protein content in dehulled bean flour due to germination (27 vs 25% for ungerninated vs germinated dehulled bean flour). However the changes in protein content observed in the present study were more important than those observed in previous studiesm. Protein content of germinated and germinated-roasted beans were significantly higher compared to roasted beans, but roasting did not significantly affect protein levels compared to dehulling. Minerals (iron, zinc and calcium): As shown in Table 2, processing did not significantly affect iron, zinc and calcium, contents in peanuts, except for roasted peanuts, where a significant decrease of 17% was observed for iron compared to raw peanuts. Khalil and Chughtaitn reported an average of 1, 5 and 53 mg/100 g Dry Weight (DW) in raw peanuts for iron, zinc and calcium, respectively, versus 1, 5 and 60 mg/100g DW in roasted peanuts. In the present study, iron, zinc and calcium content in raw peanuts were 4, 3 and 66 mg/100 g DM, respectively, versus 3, 3 and 68 mg/100 g DM in roasted peanuts (Table 2). Iron, zinc and calcium content were significantly affected by germination, roasting and germination-roasting of beans (Table 2). It could be assumed that the changes were mainly due to dehulling, with calcium showing the most important decrease. Calcium was not measured in dehulled raw beans due to the accidental loss of samples, but Siddhuraju et al reported a drastic decrease of 56, 44 and 56% of calcium levels in dehulled white variety of Marthandam, white variety of salem and black variety of marthandam germplasms, respectively compared to raw seeds. Singh et al.” also reported a considerable reduction of calcium during dehulling of chickpea cotyledons. Thiamin and riboflavin: Thiamin levels decreased by 40% with roasting of peanuts due to heat, but did not change after germination, whereas, the increase of 33% after germination-roasting could not be explained (Table 2). On germination of beans, thiamin increased by 12%. but a decrease was observed after roasting (9%) and germination-roasting (21%) (Table 2). 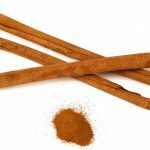 As it is generally known, steeping in water and germination could increase thiamin in thy seedsm as the result of chemical changes. Table 2 shows a significant increase in riboflavin after germination of peanuts (71%) and a decrease occurred after roasting (74 and 38% for roasting and germination-roasting, respectively), compared to raw peanuts. Riboflavin in peanuts was partly destroyed by roasting. Heat processing may have destroyed some of the riboflavin in beans as well. 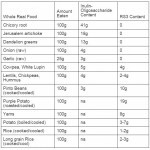 Riboflavin showed a drastic significant increase of 432% with germination of beans, compared to the raw seeds (Table 2), probably due to dehulling and 12 h steeping of the seeds in water before germination. Thiamin and riboflavin in dehulled raw beans and peanuts were not measured. Riboflavin in peanuts has been seen to be more heat-labile than riboflavin in beans, probably due to the differences in the structure and the physiology of the seeds. The activity of enzymes involved in the synthesis of riboflavin during germination and seed coat weight could also affect riboflavin in both seeds. The present study showed that germination involves a number of complex chemical changes(“1, which could affect the chemical composition of peanuts and beans in many ways. The effect of germination and roasting on the nutritional value of peanuts and beans needs more investigation. 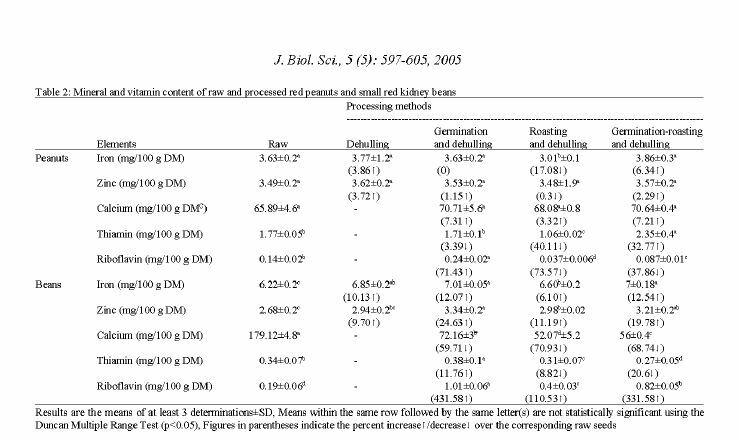 Phytates: There was a significant decrease (p<0.05) in phytate after germination, roasting and germination-roasting of peanuts when compared to raw seeds and to dehulled raw seeds (Table 3). The elimination of peanuts seed coat did not make a significant difference in the phytate content in dehulled raw seeds compared to raw seeds, as opposed to beans. In beans, the combination of germination and roasting significantly reduced phytate levels by 12% compared to raw seeds. Significant changes in phytate content were not observed after germination and after roasting of beans compared to raw seeds. Phytate reduction was greater in both peanuts and beans when germination was combined with roasting, compared to germination alone and roasting alone (Table 3). Alonso et al observed 5.66, 30.2 and 21.4% decrease (p<0.05) of phytate in kidney beans due to 12 h soaking at 30°C, 72 h germination and extrusion at 156°C, respectively. Apata and Ologhoboi’l reported a 17% decrease in phytate after roasting of kidney beans for 30 min at 105°C. The decrease in phytates in beans and peanuts observed with germination-roasting was probably the result of the combined effect of an increase in phytase activity during germination, the leaching-out effect during 12 h steepine and the hydrolysis and heat destruction of some molecules of inositol hexaphosphate to penta, tetra and triplicsphatem. Increase of phytates in dehulled raw seeds was 4 and 13% for peanuts and kidney beans, respectively compared to raw seeds, but dehulling did not significantly change phytate distribution in dehulled raw peanuts compared to raw peanuts probably due to the low ratio seed coat weight/whole seed weight. Condensed tannins: Condensed tannins significantly decreased (p<0.05) in both legumes by 100%. The decrease reported by Alonso et aL was 72% after 72 h germination and 84% after extrusion, compared to raw seeds of Phaseolus vulgaris. In the present study the seeds were dehulled after germination, roasting and germination-roasting and that may have changed the distribution of condensed tannins in the seeds. Phytic acid is accumulated in legumes in the globoids located in the cotyledons, which is one of the inclusions of the protein body. Major amounts of condensed tannins in legumes are located in the seed hull or testa with low or negligible amounts located in the cotyledons. The physical removal of testa or seed coats by dehulling could have changed phytate distribution in dehulled raw beans as opposed to dehulled raw peanuts and consequently may have increased phytate content in dehulled raw beans and at the same time eliminated condensed tannins in dehulled raw beans and peanuts. Trypsin and a-amylase inhibitors: a-amylase inhibitor activity decreased significantly (p<0.05) after roasting and gemination-roasting in both peanuts and beans and trypsin inhibitor activity significantly decreased (p<0.05) after roasting in peanuts and after germination-roasting in beans, compared to raw seeds (Table 3). On the other hand, dehulling significantly increased (p<0.05) trypsin inhibitors in raw beans due to the seed coat weight. The reduction of trypsin and a-amylase inhibitor should be viewed in light of their location in the seeds. Trypsin and a-amylase inhibitors are proteins mainly located in the seed cotyledons. The removal of seed coats produced increased trypsin and a-amylase inhibitors in dehulled raw beans as in phytate and there was an additional increase on trypsin and a-amylase inhibitors due to the 12 h steeping of the raw seeds prior to dehulling and processing. It is generally known that heat treatments, especially hydrothermal treatments are very effective in destroying protease-inhibiting activitym. On peanuts, reduction of trypsin inhibitors was effective after roasting (23%) compared to raw seeds and in beans after the combination of germination and roasting (11%) compared to raw seeds, but the dehulling effect may have influenced the changes in antinutritional factors observed in both seeds. Perkins and Toledom reported a 100% inactivation of trypsin inhibitors after a treatment at 120°C for 150 min, but the heat treatment seemed to be too long and may have destroyed other important nutrients. Comparable findings i.e. 86% reduction of trypsin inhibitors in extruded kidney beans compared to raw seeds, have been reported by Alonso et al. a-amylase inhibitors, which are generally known to be heat sensitive, were reduced not only by roasting, but also by germination (Table 3). In both legumes, the combination of germination-roasting showed the most important decrease in a-amylase inhibitors; 71% in peanuts and 73% in beans compared to raw seeds. Alonso et al. reported the reduction of a-amylase inhibitor activity by 156°C extrusion (100%) and 72 h germination (33.8%) of red kidney beans. When comparing raw seeds, peanuts had the highest energy value, crude protein and fat. Some minerals, especially calcium were probably lost by dehulling, but could also be more bioavailable due to the reduction of antinutritional factors. Calcium was severely lost in beans, but dehulling could remove all condensed tannins. The use of whole beans should be investigated by increasing the steeping period prior to processing, in order to eliminate condensed tannins by leaching in steeping water, to reduce the loss of calcium. Dehulling before roasting and after germination significantly increased phytates, trypsin and a-amylase inhibitors concentration in beans but had proven to be a beneficial step to be incorporated in the processing methods used in the present study, because it eliminated condensed tannins, increased energy value and protein level, in both peanuts and beans and fat content in beans. The combination of germination and roasting was the most effective processing method in reducing antinutritional components in both peanuts and beans, except for trypsin inhibitors in peanuts. 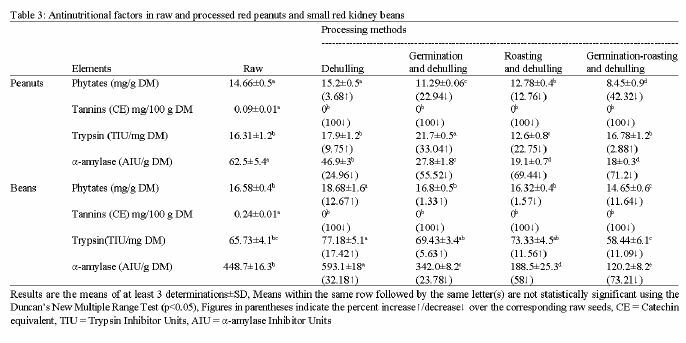 There were some similarities in the effect of processing on peanuts and beans in view of the elements assessed, but antinutritional factors levels remained higher in processed red kidney beans, making them apparently less advantageous than processed peanuts. However since moist heat is more effective in reducing digestive enzyme inhibitors than dry heat, it is assumed that wet cooking will effectively inactivate trypsin and a-amylase inhibitors, although the present study did not investigate this aspect.